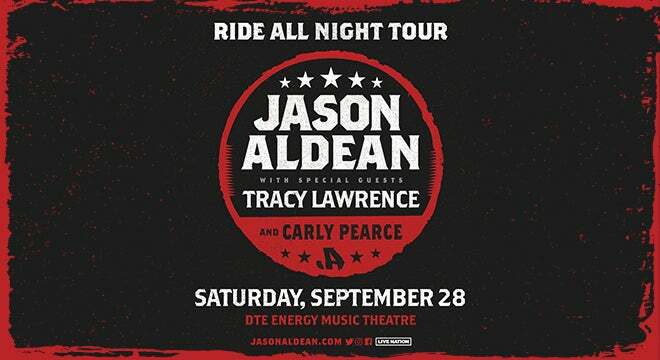 Three-time and reigning ACM “Entertainer of the Year” Jason Aldean announced details today for his “2019 Ride All Night Tour.” Aldean will visit over 30 cities nationwide including at stop at DTE Energy Music Theatre on Saturday, September 28 at 7:30 p.m. with special guests Tracy Lawrence and Carly Pearce. The "musically muscular, big-tent entertainer” (The Atlantic) will deliver a mix of new hits and fan favorites as he knows to choose “a pile of hits to keep a sold-out crowd singing along for 95 minutes" (The Oakland Press). Proving to be a “natural born entertainer who consistently delivers his best” (CMT) Aldean "has got this thing down pat” (UPROXX) as “he sells out stadiums and continues to bring his singles to the top of the radio charts” (Forbes). Aldean is only the second Country act in history to score four consecutive chart-toppers on the all-genre Billboard 200 albums chart with his current album REARVIEW TOWN, with six of his previous LPs having achieved Platinum certification or better. His record-breaking eighth studio album includes his current Top 5 and climbing hit “Girl Like You” along with the two back-to-back multi-week chart toppers “You Make it Easy” and “Drowns The Whiskey." The path paved by his wide-open sure-footed approach has defined the genre’s 21st century including more than 17 million total album sales, 21 No. One singles and countless recognition from the Grammys®, ACMs, CMAs, BBMAs, People’s Choice Awards and more.